Birds use baths both for drinking and for bathing. 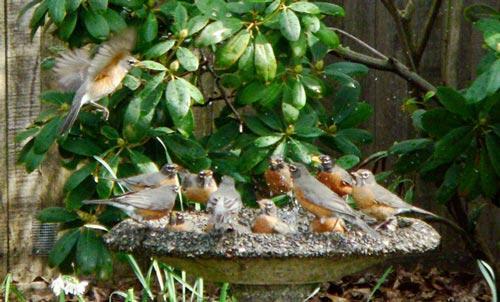 Almost every species of bird in your yard will visit a birdbath, including both the common feeder-visiting birds and other birds that rarely or never visit feeders, such as mockingbirds, black phoebes, robins, flickers, and bluebirds. While baths will not have as much constant activity as a seed feeder, their advantages in more widespread appeal and minimal ongoing costs (no seed to buy!) make baths an ideal feeder complement. 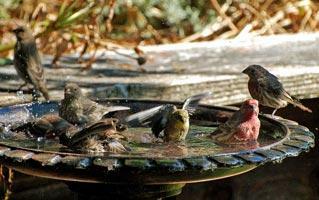 Bird bath water should be replaced every few days, with your exact frequency depending on bird usage, other sources of litter (i.e. overhanging trees), and water capacity (during summer heat, very shallow basins may need to be refilled every day). If practical, giving your bath a quick rinse with your garden hose before each refilling will go a long way towards keeping it clean. If more serious cleaning is needed, the next step is to use a hard-bristled scrub brush to remove grime before rinsing and refilling. This should be adequate for most cleaning; on occasion you may wish to apply a specialty bird-safe birdbath cleaning product or a low concentration (10% or less) bleach solution before scrubbing, rinsing, and refilling. Some baths are simply dishes set on the ground, while others stand on pedestals, attach to poles or deck railings, or have chains or wires for hanging. Your choice of bath will have some effect on the birds you attract: very small baths will discourage large birds; lower baths will be visited more often by ground-feeding birds such as quail. Choose a shallow basin to allow small songbirds to bathe in your bath. If the dish is too deep, stones placed in the bath may encourage smaller birds to bathe safely, rather than just perching on the edge to drink. In general though, almost any bath that isn’t obviously too deep will attract birds—get one that looks good and fits in your yard! 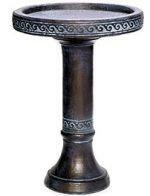 We carry a wide and always changing selection of freestanding metal, concrete, and fiber-clay bird baths. Shallow basins attract small songbirds. Local picture by Susie Kelly. Concrete baths are made in the Bay Area following traditional methods. Hanging baths are available in metal, ceramic, or plastic models. 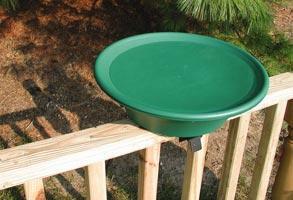 Deck-mounted bird baths are another flexible option for placing a birdbath.